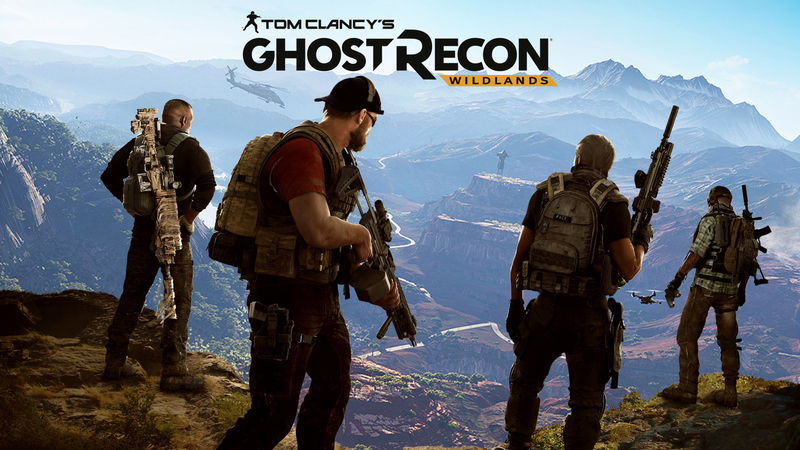 In an early article we took a look at the open beta performance of Tom Clancy’s Ghost Recon Wildlands, but that was with pre-launch optimized drivers from both parties. Now that Wildlands is finally out in the wild we are revisiting the game to see how both parties fare and what kind of performance you can expect if you’re looking to pick this title up. 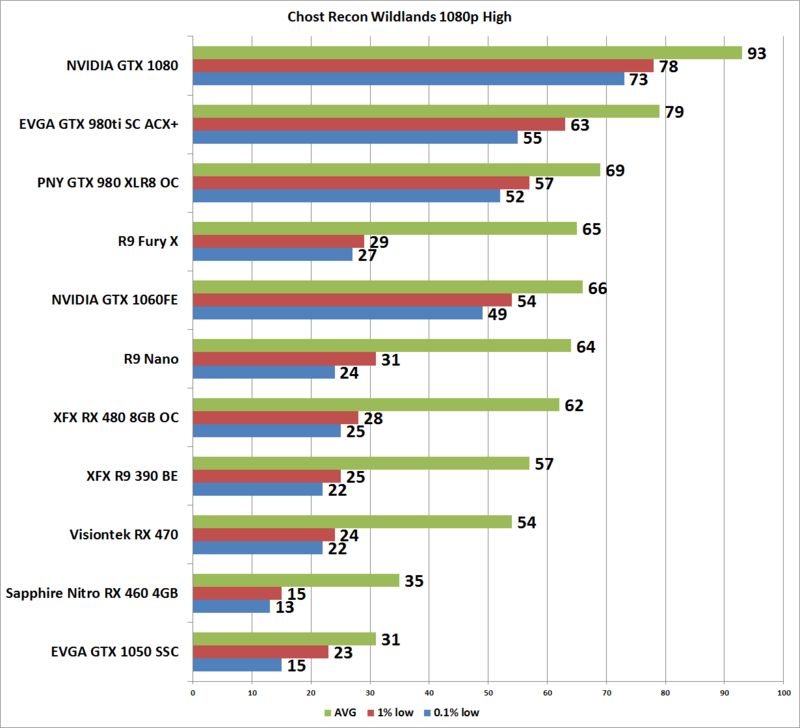 With both AMD and NVIDIA having updated their drivers for Wildlands and its first big patch it’s time to see how well they both put the hammer to the AnvilNext engine, sorry couldn’t resist. 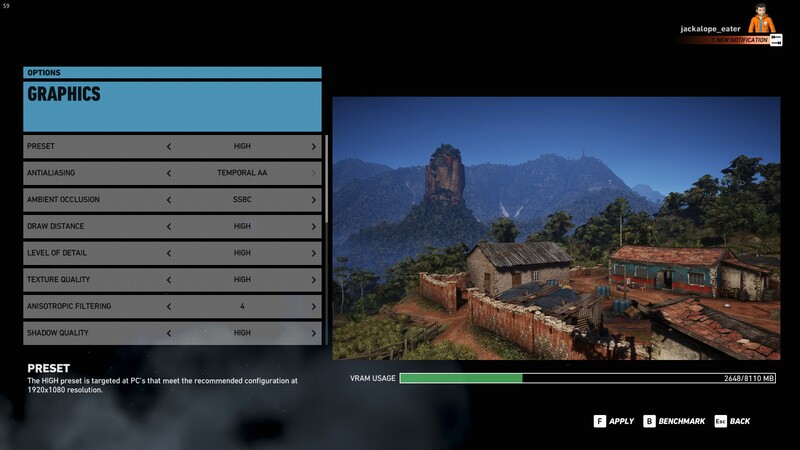 While we don’t have it ready right now we will be including Ryzen results going forward along with a CPU scaling portion for PC games performance articles. Starting off with still the most popular resolution we see the GeForce cards holding a clear advantage in the not only the top of the charts but the minimum 1% and .1% lows. The Radeon cards are putting up respectable averages but the minimums are hindering the game play with consistent stuttering. Moving up the pack to 1440p we see very little change in the charts especially when concerning the minimum. At this point I’m sure someone is looking at the Fury cards and questioning the frame buffer, but I assure you at 1440p High we are far from exceeding the 4GB of HBM. Only the serious need apply here, and bring a GSync monitor with you. 4k is far from a easy feat here with this game. Only the GTX 1080 is able to keep the 1% and .1% minimums above the 30 fps mark. A tough cookie indeed. 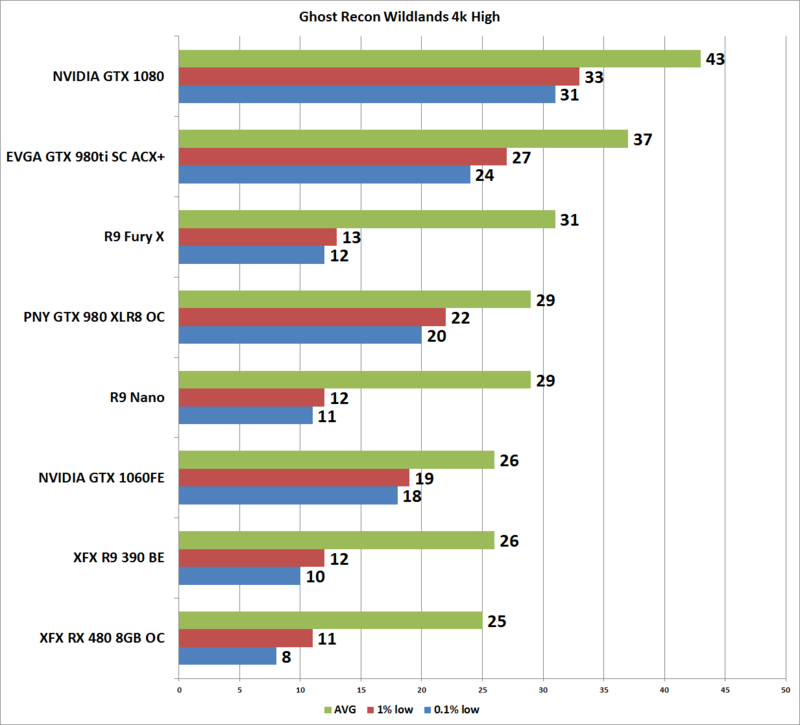 Even though Radeon had their GR:W driver out first, a day before launch to boot, they still have a ways to catch up on the bottom end of the frame rates. That’s not to say they can’t, because their average frame rate is good except on Fiji where it should be higher, so hopefully there’s some tweaks yet to be had. While all cards are showing an overall performance advantage over the open beta Radeon has still yet to catch up in this regard. 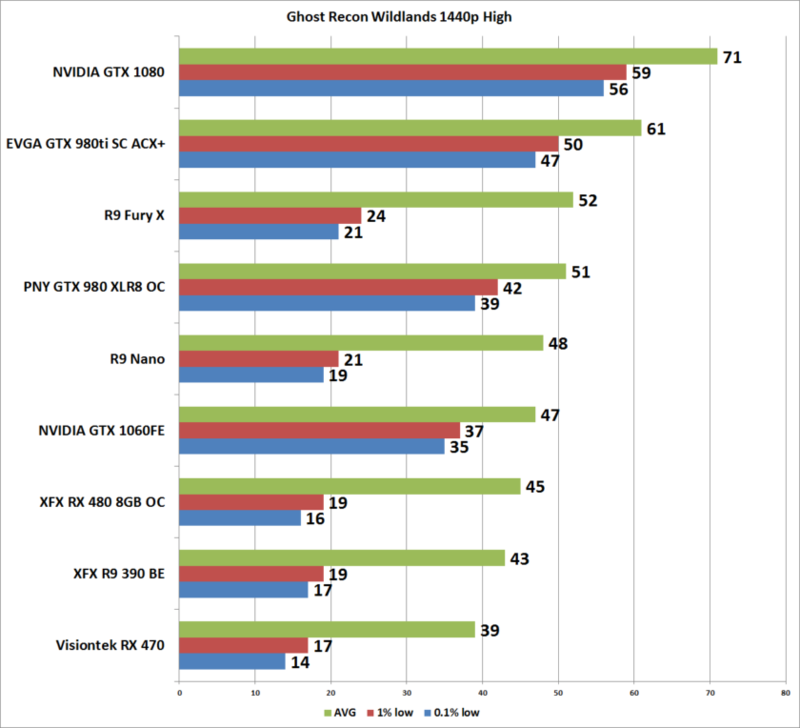 Meanwhile the GeForce cards, outside of the GTX 1050 (and for that I recommend much lower settings), are showing respectable minimums resulting in the smoothest game play experience. So if you’re gaming on a mid-range or better GeForce choose a preset and happy hunting, but if you’re on Radeon you’ll need to take some time to tweak the settings for better performance.